Born in Schleife (Slepo) Germany on March 4, 1938, Kito Lorenc was the grandson of the noted Sorbian prose writer, Jackub Lorenc-Zalĕski. He attended high school in Cottbus. From 1956-1961, Lorenc attended Karl Marx University in Leipzig, majoring in Slavic Studies, eventually joining the Institute for Sorbian Studies in Bautzen. 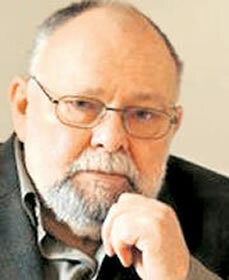 A leading exponent of the Sorbian language spoken by a national minority in the former East Germany, Lorenc worked as the dramaturge at the State Ensemble for Sorbian People's Culture from 1972-1979. He now lives in Wuischke where he works as a freelance writer. He has twice been awarded the Heinrich Mann Prize, in 1974 and 1991, and he won the Lessing Prize in 2009 and the Petraca-Preis in 2012. Lorenc has translated several books into Sorbian and written poetry in both German and his native language. He edited an anthology of Sorbian poetry, Light, Justice and Freedom, in 1963. German poet Johannes Bobrowski died on 2 September 1965. His surname dervies from the Slavic word bobr for the beaver. "At the Winter Window," copyright ©2008 by Elizabeth Oehlkers Wright.